“It is not up to you to complete the task but neither are you free to desist from it” (Pirke Avot 2:21). This has been a week of swirling national news that moves so quickly and makes change seems beyond our control. Despite the changing headlines the JSS refugee resettlement team continues to stay focused on the project of welcoming new families to our community while advocating for our country to keep our borders open. We write you this update as an antidote to the helplessness that can arise from the current events of the day. 1. JSS Case workers Rihab Taha and Becca Schwartz are working hard with volunteers to prepare for the next family who will arrive next week. This Congolese family is made up of a mother and three children. Plans are being made to give extra support to this single mother. If you speak Swahili and would be able to volunteer with JSS, please contact Rihab. 2. As new families arrive our original families are feeling more settled in Madison. The three first families have been here more than 90 days. Ninety days marks a shift in the official status of the resettlement effort as it means that the initial period of Resettlement and Placement is complete. In the first 90 days the State Department dictates several core services that the resettlement agency (JSS) must provide to the new families. These include setting up health assessments, enrolling adult family members in ESL classes and children in school, a cultural orientation to life in the U.S., an introduction to public transportation and much more. Although families have some more grounding in the US and most have jobs after 90 days they still need a lot of support. As we have always done with our clients, JSS continues to serve families after the initial 90 day period. We have committed to work with the families we resettle until they are independent and thriving in our community and that does not dramatically change after the initial resettlement period. 3. Earlier this week Rabbi Bauer spoke at Holy Wisdom Monastery on a panel about the intersection of spirituality and politics, sharing the work that JSS is doing as we live up to our tradition of welcoming the stranger. 4. 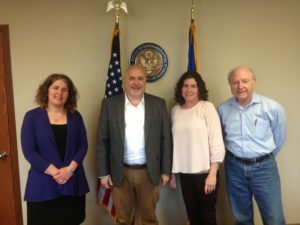 On Wednesday Rabbi Bauer and two JSS volunteers, Bob Skloot, and Cynthia Hirsch, met with Congressman Marc Pocan. 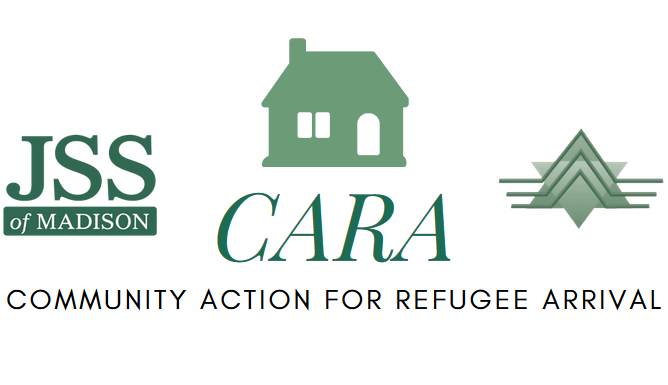 We shared the details of our local resettlement efforts and ask for his help and advice on advocating for the continuation of the refugee program in the 2018 budget. We will be asking you in early June to join us in a national effort to bombard congress with phone calls advocating for refugees. Please watch for updates.